View the image in the Photos app. Tap the Crop / Rotate icon. The icon is shown here. The screen changes as illustrated in the following figure. The tools that are presented crop and rotate the image. Rotating and cropping an image. Drag any of the four corners to crop the image. As you drag, portions of the image are removed. 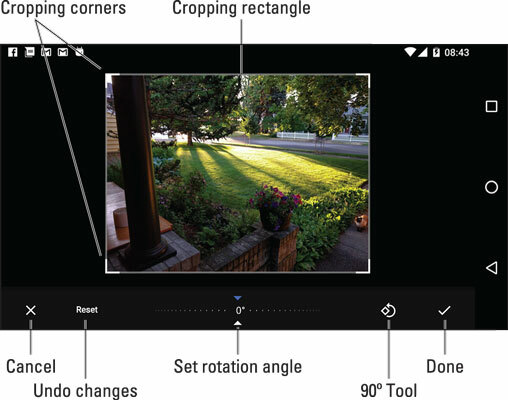 You can also drag the image within the cropping rectangle to modify the crop action. The image is cropped. You can continue to edit, or tap the SAVE button to make the changes permanent. If you’re unhappy with the changes after tapping the Done button, tap the Action Overflow and choose Undo Edits.